I love lashes, my avatar feels naked without them! I won’t go anywhere without my prim/mesh lashes, so I’m always looking for new ones to add to my collection. 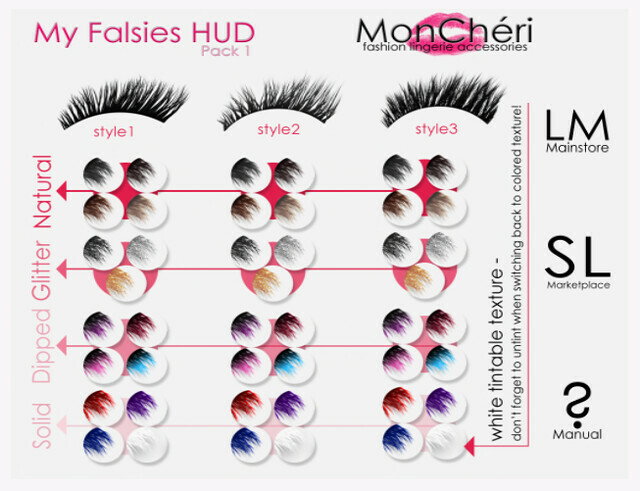 Mon Cheri just released the new Falsies lashes that includes a fantastic HUD to change between 3 styles, and different textures style such as Solid, Dipped, Glitter, Natural, or even plain White, so you can tint them any color you want! I think that these lashes are really nice, and easy to fit, but they’re also very full & long. When I wear these, I will probably not wear the lower lashes, and just wear the top lashes + some more subtle lower lashes. The Mon Cheri lash pack includes a top prim, bottom prim, plus top+bottom prim. A lot of people don’t know the difference between their mesh lashes, cos I see the same questions being asked over and over again. The most popular one is, “Why are my lashes clumpy?” Because you’re wearing mesh Individual Prim Lashes or Sculpted Prim Lashes (these are the only two styles that will clump). There’s probably a fix to this, but not if you like to have your graphics set to Ultra & with shadows turned on. Mesh Individual Prim Lashes = Individual lashes, no alpha glitching, will clump from far away. Mesh Alpha Texture Lashes = Single prim with alpha texture applied, does NOT clump, has alpha glitch with the default lash (darn bug that LL fixes, and breaks with each viewer update). Prim Alpha Lashes = What we all have. They’re just regular prims with alpha texture applied. I love these though, cos the lashes are so fine & pretty! Mesh Alpha Texture Lashes are great! I love my [email protected] ones, but I usually pair it with something else on the top lashes to make it fuller. To have really great lashes, you should wear the lash alpha to get rid of the default SL lashes AND add a black eyeliner, this will fill in any gaps and create a nice smooth line where the prim meets your eyelid. Do you have any other tips to add to this? What are YOUR favorite lash brands or lash styles? I bought these too! I really like them, and actually find they are a bit similiar to the Redgrave ones I usually wear (in Extra Long). So far, my “staple” lashes have been my Redgrave lashes, but I really love the Mon Cheri lashes. I love the long lashes because for some reason my avatar can wear a bit more makeup without looking ‘drag-a-licious’ lol. I also like Maxi Gossmer’s Party Swallow Wings lashes, because they’re just so crazy and good for fantasy or burlesque costumes. I got these lashes today, and they are beautiful, well done, but as u said, long and full. It’s like i have heavy make-up with them. I’m not sure if I am going to wear them regularly. I like these lashes from Redgrave: Eyelashes -16- Elemental, but they are not mesh. a pair of mesh lashes by Beetlebones. But i love these however the possible looks with them are endless. Very pretty…. but way too much polygon for what it is and… I feel this is taking on the worst path by far. This is going to hurt the general crowd by weighting down with high render score. I’d be happier to see if creator made improvement there.